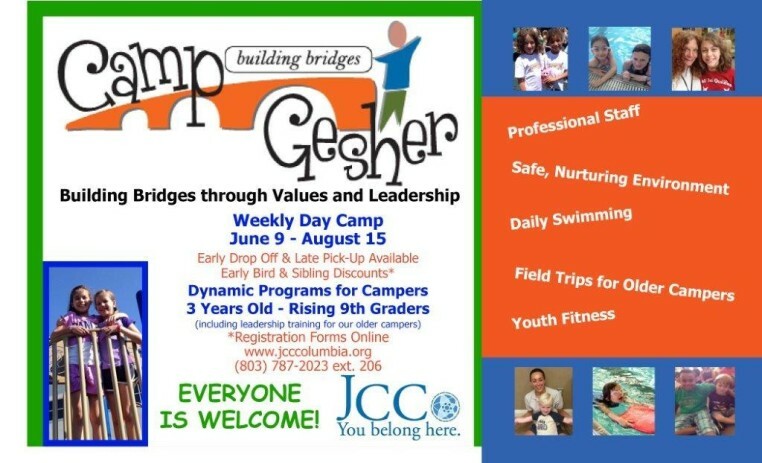 Camp Gesher at the JCC! Join friends from all backgrounds and spend summer at Camp Gesher at the Katie and Irwin Kahn JCC! Our camp features dynamic programming, amazing athletic opportunities, leadership development, impressive guest speakers, field trips for older campers—all based in Jewish values, but appropriate for all. Everyone is welcome! For more information or to register, contact Melanie Pace at 803.787.2023 or melanier@jcccolumbia.org.